Price is $35 per person per day, with a discounted rate for a 3rd and/or 4th passenger. Dinner, T-shirts, Hoodies, Flags are all optional. Come drive the greatest, coolest, most scenic,… (the list goes on and on) trails in the world in your UTV/SxS. Also our vendor row promises to be bigger and better than ever. Come see the latest advances and accessories the industry has to offer. Don’t forget the nightly events as well as the catered dinner and raffle! Is this your first time attending Discount Tire Rally on the Rocks? If so you may have some questions about what to expect while you are with us. Below is some important information that will answer many of your questions. If you still can not find the answers you are looking for feel free to contact us! How much is Discount Tire ROTR? Price will vary as the price changes depending on the amount of trails and appearel you choose. Onsite Registration (May 15th – 19th) *Onsite Registration DOES NOT INCLUDE event T-Shirt. Children 11 and under are free and DO NOT INCLUDE a Discount Tire ROTR event T-Shirt. Is the registration fee the same for drivers and passengers? Yes. 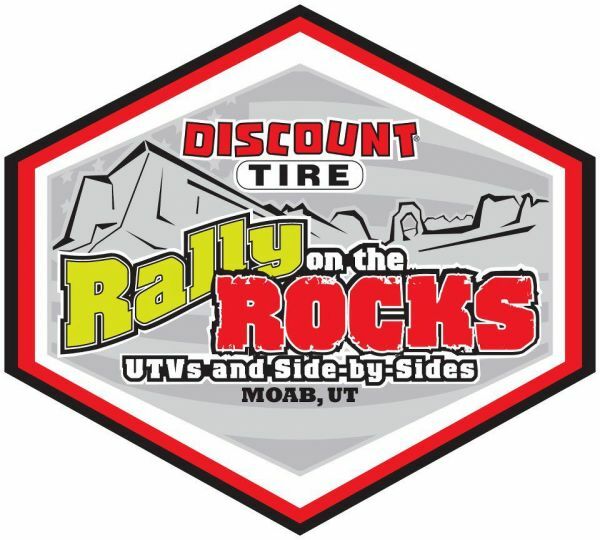 Insurance, dinner, t-shirts, and all BLM fees are the same ammount for Discount Tire ROTR for both drivers and passengers, therefore, registration fees are the same for those that wish to attend the event. Can I drive my SxS/UTV around town? Can I change my trail selections once selected? NO. Please don’t “drop in” on a trail, if we go over our allotted BLM car count it affects our BLM rating. Will my stock side by side work on the trails in Moab? Yes. We offer many different options for the stock machine. Are helmets required? No, but they are highly encouraged. What equiptment do you recommend? Basic repair tools, tire repair kit, spare belt, misc parts. Along with personal basics such as water, snacks, lunch, sunscreen, jacket, rain gear, first aid kit, camera and extra memory cards! Our trail guides will have a gear bag with them at all times with some of the items handy to have out on the trail too. Are there Side X Side rentals available? Discount Tire Rally on the Rocks does not have rentals available. However there are many great companies that offer Side X Side rentals in Moab. Are ATV’s allowed at Discount Tire Rally on the Rocks? No. Your vehicle must have a steering wheel and roll cage. What is the weather like in Moab this time of year? The normal max temp is 82.3 with the normal low temp of 50.1 It is a good idea to be prepaired for rain as we have seen it rain at the rally before. A rain slicker & jacket are good to have along with you. If you register onsite you may or MAY NOT get the trail selections that you want to run. We advise you to pre register online for the highest chance of running the trails that you want to run. All trails have minumum and maximum participants, Discount Tire ROTR reserves the right at their sole discretion to cancel scheduled trails. If that happens, we will do our best to substitute trails of equal difficulty. Have additional questions? Feel free to contact us.